You know what I remember most about my wedding day? Not my surprise at how many people had packed into the white wooden pews of the historic chapel. Not the moment of panic when my about-to-be husband dropped the wedding ring onto the floor in the middle of the ceremony. Not even the annoying wedding photographer who kept insisting we smear wedding cake over each other's faces. No, the memory that stands out most clearly from that day, the one I return to when I want/need to recall the butterflies in my stomach that accompany young love, is a moment later that evening as we drove to our honeymoon in Toronto. We stopped at a small convenience store, a tiny, cramped little place, the ceiling-high shelves jam packed with everything from soup to shaving cream. I don't remember why we stopped, what "convenience" we needed. But I was alone at the front counter after making my purchase, peering around the overflowing shelves to see where Jim might have wandered off to. "Is there something else you need?" the clerk asked me. "No," I replied, "I'm just looking for my husband." And with the utterance of that word - husband - a shiver I can still feel ran through my body. What a momentous word, heavy with portent and responsibility. Saying it for the first time plucked me from girlhood and instantly, ready or not, plopped me down into womanhood. It was a word that meant I was grown up, with a grown up relationship and responsibilities. Thirty seven years later, having now said the word thousands of times, I'll admit it isn't always accompanied by a flurry of girlish excitement. When you live with someone your entire adult life, you learn more about them then is probably good for any two people to know about each other. But familiarity doesn't have to breed contempt. My husband's oh-so-familiar habits and attitudes are usually more comforting than contemptuous. Sure, like most wives I complain about the snoring, the TV, the long showers and short conversations. And he still wanders off when we're shopping and I have to look around for him after I'm done. 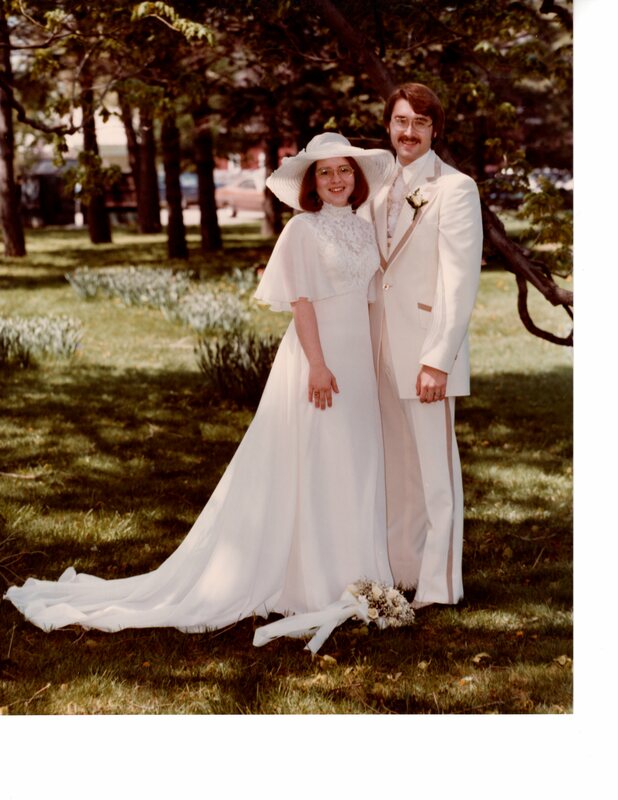 But mostly I'm thankful that we've turned out to be as compatible as we thought we would be when we took joined our lives together 37 years ago today. Like that little convenience store on the 401 in Windsor, we've stocked the shelves of our relationship with everything imaginable until they're filled to overflowing. I picked a really good husband. I hope I get to call him that for another 37 years at least.